The consumer economy in Africa faces powerful waves of disruption and unprecedented change. African consumer lifestyles are shifting at a rapid pace, and attitudes towards brands are in constant flux. With the diversity of 54 countries and a strong rural and urban divide, African markets present exciting opportunities and intense challenges for companies large and small. 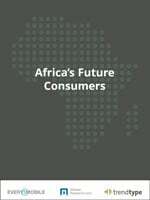 Trendtype’s white paper Africa’s Future Consumer is packed with new insights and helpful infographics to bring you up to speed on recent dynamics in African markets, with a close look at Africa’s young consumers — including their brand attitudes and their shopping behavior. The data in this white paper draws on Trendtype’s proprietary database and surveys conducted by Every1Mobile. Trendtype is a market intelligence company that specializes in trend analysis, strategic insight, market entry, and growth strategies.